Earlier in the week, I made a stew using slowly simmered pinto beans and crumbled, browned chorizo sausage. I sauted onions, carrots, and celery together to flavor the stew. I combined it all, with the liquid from the leftover beans, and it became a wonderful dish with which to flavor other dishes, as well as a nourishing dish on its own. 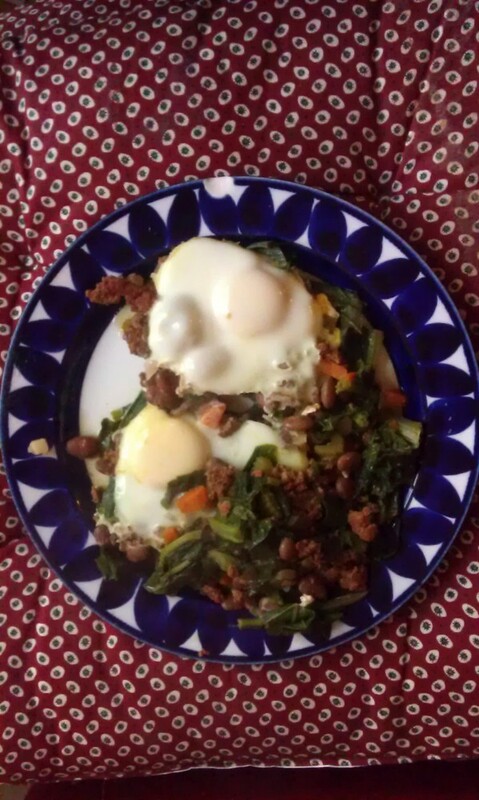 For breakfast, I’ve been cooking up several handfuls of torn turnip greens (water still clinging to leaves) in a frying pan, throwing in a cup of the chorizo bean stew, letting it simmer a bit, then adding some eggs to poach/steam on top (with cover on). Wait a few minutes and you have a perfect huevos rancheros dish (sans tortilla)…..low carb, full of greens, and protein from beans and sausage. I removed whatever fat and some of the stronger cayenne flavored spices from the top, after refrigerating the stew overnight.